but I got a lot of toys..."
-- Bad Religion, "21st Century Digital Boy"
In the futuristic world of Wall-E, humanity embraces consumerism with a zeal that turns the Earth into a huge garbage bin. After the planet becomes uninhabitable, everyone blasts themselves into space in huge luxury spaceships for an extended vacation. They leave behind an army of little trash robots called "Wall-E's" to clean up their mess. Eventually all the little Wall-E's break down except for one, who continues his work diligently, stacking little cubes of trash into skyscrapers of refuse. Eventually Wall-E runs into the sleek, female robot of his dreams, named Eve. Wall-E helps Eve find the last surviving plant in the world. Eve takes the plant back to her home-base ship, named Axiom, to prove that Earth has become habitable once again. Wall-E follows Eve into space, back to the Axiom where thousands of people have been living for hundreds of years. Thanks to Wall-E and Eve's efforts, the people aboard the Axiom catch a new vision for their lives and turn the ship back around toward Earth. Wall-E demonstrates the fact that modern technology can be good or bad. Excessive dependence on machines, for example, is detrimental to our physical, mental and spiritual health. God designed us to thrive on working purposely with our hands and our minds. We are also meant to grow through life's struggles. When our daily lives become too easy, we lose our moral bearings and grow backwards toward immaturity. Technological advances give us more power over the world around us, but that's not always a good thing either. Thanks to fossil fuels, for example, our ability to expand, consume and pollute has increased exponentially. We have also figured out how to blast ourselves into space, which means we can explore the universe... but still, a healthy existence is impossible on any other planet besides earth. Apart from earth's gravity, for example, we lose muscle and bone mass, which will inevitably have grave effects on our mental and spiritual health as well. God designed us to live on Earth. We might devise ways of living that seem more efficient (eating fast food for example) but God's natural design will always be best. In Wall-E people drink their food out of a straw, which seems more convenient, but there is more to eating than just transporting nutrients into our stomachs. God designed us to eat solid food, which includes the exercise of chewing, which is also related to our God-given need to exercise. Also, advancing technology can encumber our ability to relate to other people. The crew of the Axiom, exchange genuine relationships for the perpetual distraction of little screens that follow them around everywhere. Thanks to their unending flow of flashing noise, they phased out meaningful interaction with other people altogether. Mental programming is another major theme in Wall-E. The Axiom's pilot had to wrestle the ship's controls away from the autopilot-robot to get himself and his crew away from their perpetual vacation, back to living. As the captain struggles to get control of the space cruiser, he argues with the autopilot, saying "I don't want to survive... I want to live!" Another lesson from Wall-E: Life is sacred. Wall-E and Eve face all kinds of dangers to preserve the last remnant of life on earth. Wall-E and Eve represent the gumption that God implanted in all people. They are inorganic, yet their extravagent passion awakened a spiritually fizzled human race. They reawakened people's desire to do more than survive -- to live. 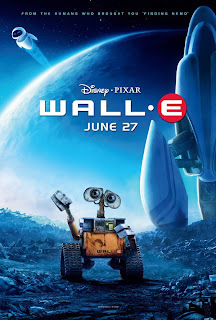 I want to see the movie WALL-E. It sounds interesting. I can't imagine getting all my nutrition through a straw. I like eating solid food. I imagine one day our earth might end up being a toxic waste dump that is uninhabitable and humans just pack up and leave for another far off planet that they will pollute just as they did earth.